Where prossies, pushers and Pedro Almodóvar used to reign in the past, the queer scene is blooming now – Malasaña is turning into Madrid’s hippest barrio. 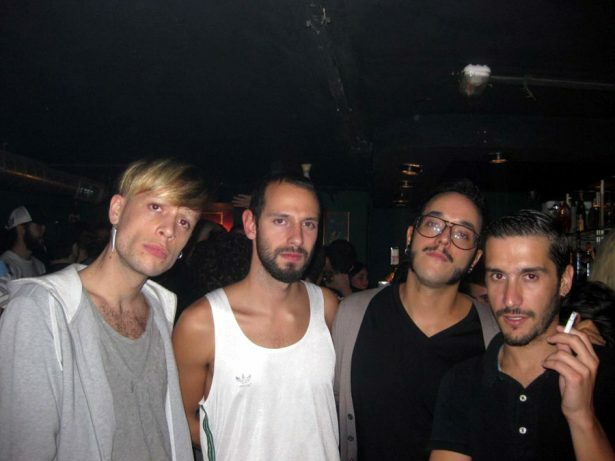 Everybody knows Chueca. The district in Madrid does not only have the highest density of gay men worldwide during Pride Week at the beginning of July. Only San Francisco’s Castro houses an equal number of bars, saunas and clubs in such a small space, where you can have an excellent time as a gay man. But right next to it, virtually only across the street, there is a neighbourhood that most people avoided until recently, but which is currently developing into the new trendy neighbourhood for the Spanish capital’s youth. Malasaña is what the Madrileños call it. A few years ago the area was still rather run-down, and whores and dealers offered their services to those who dared to come here. A rough patch. It is only a few streets, but it was here that two important revolutions originated. In 1808 the Madrileneans resisted Napoleon’s occupation – the Plaza Dos de Mayo is named after the May 2nd uprising – and in the 1980s the Movida began here, the socio-cultural movement which in the decade after the death of dictator Franco in 1975 stirred up the whole of Madrid. One of its leading figures is now the country’s most important movie director: Pedro Almodóvar. At that time he still performed with his lover as a rock drag act. The Movida caused creative unrest and sleepless nights with wild actions and parties. This mixture of a spirit of optimism and obstinacy can be felt again today. Because rents were cheap, artists and creative people have moved here in recent years, opening small design shops and hip cafés, and suddenly this place is regarded as the hottest area in the city. The heart of Malasaña is the so-called Triball or “Triángulo de Ballesta”, a street triangle around Calle Ballesta, which is bordered by the Gran Via and the Corredera Baja de San Pablo and connects to Chueca with Calle Fuencarral to the east. 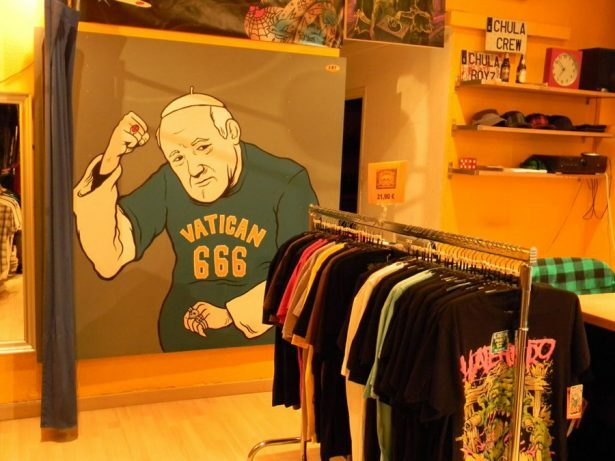 You can find here almost everything from graphic t-shirts to sneakers and vintage furniture during the day. The best way to relax from your gay shopping spree is in one of the bars of the Plaza Dos de Mayo, sipping a vermouth. Queer party life buzzes at night. This means mainly one thing in these days: Retro. Hardly a bar or a club that is not vintage somehow. Like “Lolina”, a café furnished with chairs and tables from the 1950s and 1960s, where you can have a nice brunch. Whether hairdresser, clothes shop or bar: the fifties and sixties are dominant in design. Sexual morality, on the other hand, is completely postmodern. Apart from Berlin and Brooklyn, there is probably no other place at present where people of all sexual orientation co-exist so peacefully. And even if the design rather points to the past: This is the future! 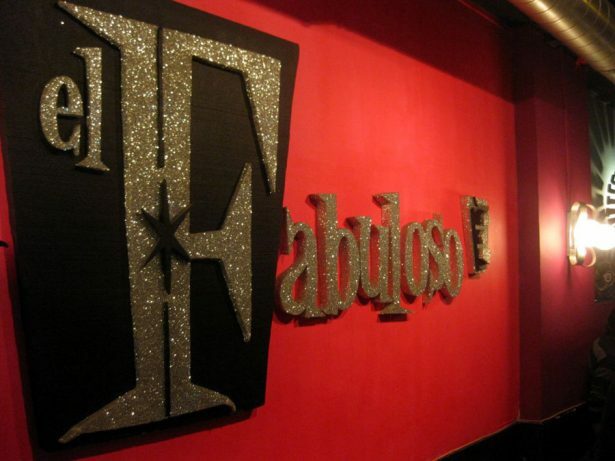 One of the hippest joints is “El Fabuloso”, which opened a year ago and is a 1950s trash dream on two floors. The wallpapers, sofas, even the people serving: everything looks as if Almodóvar and John Waters had opened a club together ot serve them and their clique of freaks. The crowd: young, hip, queer and uninhibited. The Rockabilly dances with his sweethart here, next to the gay Indie boys, and everyone parties as if there were no tomorrow. Great! After a short visit to “Club Démodé”, a former brothel where good-looking people dance to electronic music, the last stop of this night is the Milky Way. 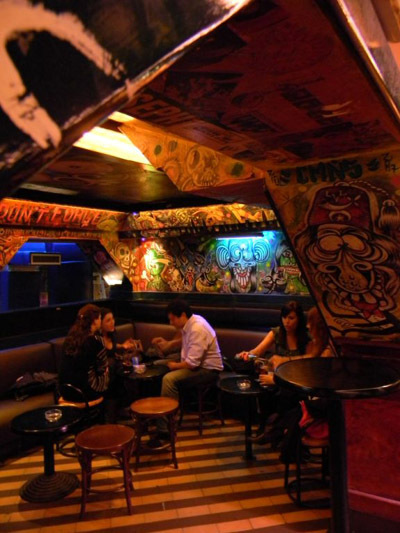 “La Via Lactea” is the name of the joint that already existed in the early 1980s, when Pedro Almodóvar and his troupe met here to concoct common crazy campaigns or to take all kinds of substances after the deed was done. They mostly occupied the separée on the first floor, its walls covered in screaming graffiti, while the gay scene partied on floor down. Even today, “La Vía Lactea” is one of the funniest places in the neighborhood. Especially at late hours, when most of the other clubs are closed and the party-happy rest of the crowd comes here to carry on. And even if Pedro likes it quieter today, the Movida lives on: A Malasaña night still ends at dawn. Official website of the tourism board including maps, tips and event calendar. Website of the association for the Malasaña district. A lot of other European airlines also serve Madrid several times daily. Malasaña houses a lot of hostales (pensions) and holiday apartments that are considered the best value for money in Madrid. Atrium Madrid (Valverde, 3) The rooms of this hotel under gay management were so delightfully coulourful that you might have assumed to have entered an Almodóvar set. El Fabuloso (Estrella, 3) 1950s hipster bar on tow floors and a polysexual crowd that dances to Rockabilly and John-Waters soundtracks while a 1960s TV Batman in a spandex suit is saving the world. Fabulous!